For an original tasting ! From 39 Chf / 31.20 euros. 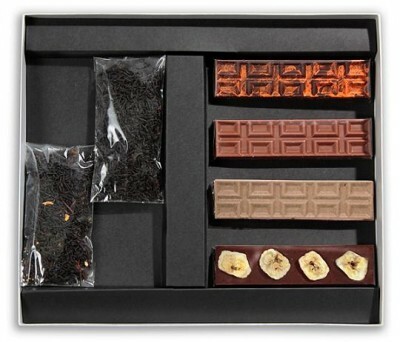 This package allows fans to discover teas and chocolates worked together to offer tasting all the strength of their flavors and their complementarity. Black Tea Darjeeling Himalayan plays with chocolates flavored with orange or caramel and "fleur de sel" scented mixture while a mixture with winters sents (orange, cinnamon, vanilla, honey, spices ...) on a base of black tea is unveiled fully with a milk chocolate 38% pure Criollo beans from Venezuela and 65% dark chocolate grand cru Maracaibo. Black Tea Darjeeling Himalayas: a small cup of cueillère 25 cl - a water temperature of 90 ° and an infusion of 3 to 4 minutes. 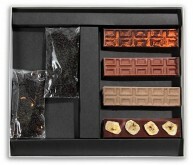 Netto weight: chocolates 100 gr and tea 40gr.